Brendon Todd’s grip is nothing like the super-strong holds of his fellow Georgia Bulldogs Bubba Watson and Harris English. Todd does, however, share the neutral position of another young Dawg, Russell Henley. The PGA TOUR is full of former UGA stars, and Todd can match talent with any of his schoolmates. The lanky pro, who actually hails from Pittsburgh, claimed his first victory at the 2014 Byron Nelson Championship. Known for his smooth, compact swing, Todd starts off with a sound grip. 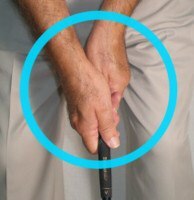 The back of his left hand is nearly square to the target while his right hand “V” – formed at the base of the thumb and index finger – lines up ever so slightly toward his right side. This is a low-maintenance grip that allows Todd to swing freely, with no complicated movements needed to square the clubface at impact. The downside? Todd struggles to keep up with his peers off the tee. With so many tour players using strong grips to boost their power, Todd ranked 148th in driving distance for 2014 with an average poke of 280.3 yards. Consider that he’s 6’3” and it appears he’s sacrificing some pop. What he lacks in power, though, this Dawg makes up for in putting prowess. 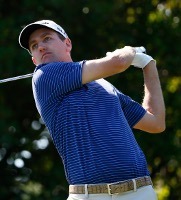 On the greens, Brendon Todd’s grip complements his fluid, pendulum stroke. His arms hang naturally from his shoulders, forming a triangle which Todd moves effortlessly, back and through. His neutral grip assures that the blade stays square throughout the stroke; the method works so well, Todd ranked sixth on tour in strokes gained putting for 2014.